On many a "next big thing" list, the mighty Puppet Rebellion deliver their stunning debut album and Stuart Ralston loves it. You should too. Try and watch one of those TV talent shows. The acts have always been “on a journey.” They've always had a truly awful experience - “me nan chipped a nail” - or similar upheaval in their lives. If there's a band that have triumphed against the odds, then it's Manchester’s Puppet Rebellion who have been on an extended journey since forming back in 2013. They immediately caught the eye and way before Even The Stars existed our David Brown raved about them on Louder Than War. Live gigs, including a Factory show with Catfish and the Bottlemen and The Slow Readers Club, and their early eps won them many fans and they stood out from the crowd. I first caught them myself at The Blackthorn Festival in the summer of 2014. Original singer Simon Monaghan was beset with sound problems as the band soldiered on around him. Despite the ongoing stage problems, their songs shone through. The following day, the band played an explosive mid afternoon set at The Sheffield Tramlines Festival. Monaghan had a lot to say and looked a menacing yet lovable character on stage. Those early killer eps made up the bulk of the live sets at the time and the debut ep - featuring Chemical Friends, The New Twenty and The Greatest Lie Ever Told - must rank as one of the standout releases of the past five years. Each tune was an instant classic, displaying an incredible versatility. The lead track was an assault on your senses before the optimistic pop joy of The New Twenty and the intensity of The Greatest Lie Ever Told. A perfect, perfect introduction to the band. On hearing the single, I was immediately hooked. Puppet Rebellion ticked all the boxes - great songwriters, incendiary live shows and a series of great singles. Dual guitarists Paul and Craig gave Puppet Rebellion a sonic edge and drive that other bands lacked. 2017 sees a new line up, with only guitarist Craig and bassist Jim present from that debut ep. New frontman Oliver Davies has made the post his own over the last two years, with the band gaining momentum with each and every show. On this, the debut album, they come good, as we knew they would. Sharing the same name as their debut single, the Chemical Friends album opens with The Pact, a classic slice of pop on which Davies dominates with his anthemic vocals. There is both a freshness and a hunger to Puppet Rebellion and this is displayed here on the opener. They set their stall well and we know we are in for one hell of a ride. Latest single the glamtastic Slave follows. A new direction for Puppet Rebellion, it's distinctively them, with yet another infectious chorus. Puppet Rebellion do anthems well - see Hey Now, Now You Try and Please Me for further proof - songs you will be singing soon. The oldest song on the album, Cupboards Painted Red, has been around for 3 years yet the new version presented here has as much passion as that recorded with the earliest incarnation of the band. Oliver’s vocals are as heartfelt as you'll hear. Beautifully produced, with added strings, Cupboards Painted Red is easily one of the standout tracks from the album. Test Pilot is another older one. Immediately infectious, it rattles along at a great pace and it has been a live favourite for some time. Underpinning all of their tunes are Jim Halliwell's bass lines - sometimes pounding, sometimes grooving, always intuitive. He rightly joins an illustrious list of stand out Manchester bassists. Now You Try sees Puppet Rebellion at the funkiest, with beats and bass lines and yet more infectious choruses a plenty. Perhaps the most euphoric uplifting track presented here is Impact. Another winner, yet there's another side to Puppet Rebellion too - two tracks, Red Light and Dark Thoughts add another dimension to the album. The album closer Dark Thoughts in particular is a thing of beauty. Stripped of the sonic layers of the rest of the album, a reflective Oliver Davies bears his soul. Dark Thoughts sounds like a one take demo where a magic is captured that won't be recreated on subsequent takes. Sometimes less is more, and this beautiful endearing ballad is a curveball ending to a truly classic album. Having long been an admirer of the band, Chemical Friends is everything I expected and more. Confident, uplifting and anthemic. They've even nailed the artwork too with a classic contemporary piece of pop art. 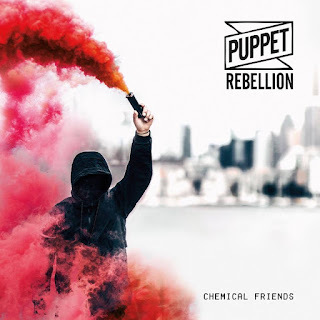 We Salute Puppet Rebellion for delivering an album we will enjoy for many years to come and we hope to see many more of them. Puppet Rebellion launch Chemical Friends with a gig at Manchester's Night People on Saturday (November 11) with support from Good Foxy, Altar Flowers and Ronda. Limited tickets remain and are available to purchase here. Saw them in Manchester last Saturday, amazing live and a great first album.